Four 1st place medals for Darc at the FISA World Rowing Championships 2011. The 2011 FISA World Rowing Masters Regatta took place from 8th September – 11th September with over 2503 boats from 37 nations taking part. One of the most modern rowing venues in the world the Lake Malta regatta course played host to the World Rowing Championships in 2009, the World Canoeing Championships whilst regularly hosting World Cup Rowing events. Having a strong Masters squad Durham Amateur Rowing Club entered 11 male crews with 13 women crews, some members doubling up and members from other clubs making up composite crews such as Peterbourgh BC, Strathclyde BC, Quinton BC, Loch Lomond BC and Nithsdale BC. The club entered an E8+, F8+, 2 E4’s, 2 F4’s, a G4, G2x, F1x, G2- and an E2-. The women entered WF 4x, WD4x, WB2x, WF2x, Mxd F2x, WC1x, WD1x,WC2x, WD2x, Mxd E2x, Mxd D4x. Over the four days of racing Durham had some very close racing on one occasion being piped to the post by 0.00.67 of a second. 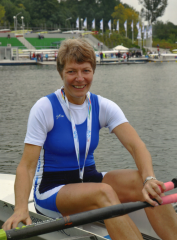 One women veteran rower from DARC, Gill Prescott, really put on an outstanding performance winning 4, 1st place positions in the C2x, D2x, a Mxd composite 4x and a Mxd composite 2x coming 3rd and 5th in her 1x, 2nd in 2 Women’s Scottish composite 4x. This entry was posted in Racing News on September 20, 2011 by admin.